The type and style of the home of an Ancient Egyptian were dictated by the wealth of the owner. The style of the houses and villas was made practical for the hot weather in Egypt. The earliest homes in Ancient Egypt were made of reeds with a shape similar to a beehive. In Ancient Egypt, rich people had proper bathrooms and toilets in their homes. Toilet seats in ancient Egypt were made of limestone. Poor people made do with a wooden stool with a hole in it. Underneath was a container filled with sand, which had to be emptied by hand. In cities, commoners lived in townhouses usually about two to three stories high. The first story of the townhome was usually reserved for businesses, while the second and third floors provided the family living space. The wealthy Ancient Egyptians did not have running water but they still had bathrooms. The equivalent of a shower room, or wet room, consisted of a stone slab on which the person would stand where water was poured over them by a body servant. Water was precious in Egypt and the wastewater drained out of the room via a pipe where the water was deposited in a large jar. The water would have then be used for watering the garden. The lavatories or toilets in ancient Egypt consisted of a wooden seat supported by bricks which had a pot filled with sand underneath. Finer houses had reception rooms and private quarters, while some even had bathrooms and toilets. 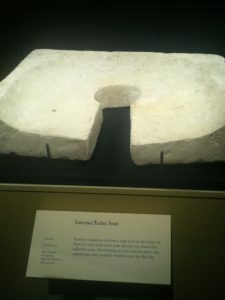 Toilet seats were at times made of limestone. Others used toilet stools. There is no evidence of more than the most basic indoor plumbing having been used in homes or palaces. Nor were the sewers in the towns much more sophisticated, consisting of an open gully running down the middle of some streets. Householders seem to have collected their sewage in pits, dumped it into the river or disposed of it in the streets, sometimes to the displeasure of passers-by. However, flushing toilets were a luxury at first and they did not become common until the late 19th century. Also popular in the 19th century were earth closets. An earth closet was a box of granulated clay over a pan. When you pulled lever clay covered the contents of the pan. In rural areas flushing lavatories did not replace earth closets until the early 20th century.